It’s time to begin the process of selling your home. How exciting! But…where to begin?! Well, the likely step towards selling your current home is finding out how much you can sell it for. There are a slew of tools out there you can use to find your home's value. You might be thinking: “Great! This will be easy!” Not so fast. We have to warn you that not all online home estimate tools are going to give you the best estimate of your home’s worth. On a quick Google search of “what’s the value of my home,” it’s no surprise - Zillow’s Zestimate® tool appears at the top. You might know Zillow because it has name recognition. What doesn’t it have? MoJo. That’s where Jovio comes in. Let’s run through what the most important factors of a home estimate are and why MoJo has an advantage over the rest. 1. No One Likes to Wait - You Want to Use a Tool That’s Efficient! You might need to sell your home fast. Or maybe you want that instant gratification of knowing what your home is worth. Zestimate takes the cake here. With a Zestimate, you’ll see a number that displays your home’s value instantaneously. But take this number with a grain of salt because there’s not much logic behind the number you see on the screen. The Zestimator calculates your home’s value based on “averages” set by historical, geographical, and tax information. The problem with the Zestimator? It's not able to account for substantial changes to your home that could alter the price. Plus, the assessed value of your home is often different from its market value. Sometimes waiting a little bit will yield better results. And that’s the case with MoJo. It will take you about 10 minutes to give MoJo your property’s information and that’s all you need to do! Then, MoJo will give you your estimated home value within 24 hours. MoJo will display an initial estimate of your home’s worth via an Automated Valuation Model - essentially what a Zestimate is. Though, that number will then get passed along to a Jovio Real Estate Specialist. This way a human will be able to assess what's special about your home. Zillow states that “there is no ability for humans to manually alter the Zestimate for a specific property.” That means the Zestimator is only putting together one piece of the puzzle. It fails to account for the market value of your home. This is why we, the humans of Jovio, will step-in after MoJo to provide our local market expertise on your home’s value. As much as we love MoJo, he needs that human assist and luckily for you, we’re here to help him out. With Jovio, you’ll have AI AND human brains on your side for this estimate. You’re basically invincible now, right?! What does it mean when we say a Jovio Real Estate Specialist will assess your home’s worth? First, we base it on any improvements you’ve made since you purchased your home. Then, we'll take a look at the overall condition the property is in. We also take a deep dive into the current market conditions. Finally, we provide a range for a listing price which will vary based on your goal. More interested in getting top dollar? We’ll price for that. Need to move in the next 30 days? We can come up with a price for that scenario too! Other AVMs outside of MoJo won’t take ANY of that into consideration. Since MoJo is a nice dude, he asks for details and even photos of what makes your home special. Plus, MoJo will let you compare your home to similar properties in the neighborhood. He then passes all that off to the Jovio humans to assess and review. Don’t tell MoJo, but he just doesn’t get the fabulousness of Brazilian walnut floors. And no robot could ever understand the value of seeing the downtown skyline from the comfort of the master bath, which just so happens to include a six-in-one toilet seat with a built-in bidet - a $6k upgrade. You get our point. Getting a Jovio human involved results in you getting the most accurate online home valuation possible. 3. It’s Time to Tame the AVMs - You Need and Deserve an ACCURATE Home Estimate! The most important part of a home valuation is accuracy. According to Zillow’s Zestimate Accuracy Table, Travis County, in particular, has a one-star rating of Zestimate accuracy. A one-star rating means that the estimates are based on a tax assessor’s value, which comes from the taxing authority of the county. And that’s it. There is wildly inaccurate data out there on over 300,000 homes in Texas. The awesome upgrades you made to your home? Not taken into consideration. The great condition you’ve kept the home in? Forgotten. What’s happening with other homes in your neighborhood? Sorry, but that Zestimate has no idea what the house down the street sold for last week. There’s way more to a home’s value than a tax assessed value. You risk losing lots of money by only taking the Zestimator’s word. Strictly automated estimates have steep limitations in accurately calculating a home estimate. That’s why Jovio built MoJo. He gets the information we need to provide the most accurate estimate possible within 24 hours. After that? You can talk to a human about it! There’s more to selling your home than a number on the screen. And that’s where the Jovio Real Estate Specialists shine. If you’re in Texas, your choice for a home estimate tool should be simple. His name is MoJo and he’s ready to meet you! Remember, not only does MoJo estimate your home based on the same tools as the Zestimator, but MoJo also has Texas-based humans to help. 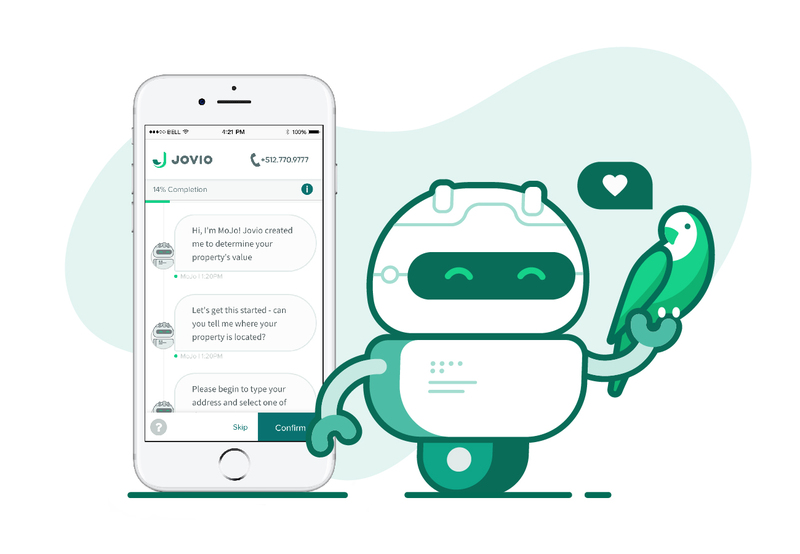 Here at Jovio, MoJo’s got your back and so do we.